Check out the new “Dutch Blast” video series added to the student Handbook. You can access all the videos by clicking HERE..
Congrats to Terrance and Ryan on earning their level one Kickboxing certification. Ryan is the youngest student to complete this process. Congratulations gentleman! Charlie’s Combat Club professional fighters Joey Elzea and Tycen Lynn are set to compete at the Tulalip Casino on February 23rd. Tickets are available at the Casino or through Ticket Master . Joey will be competing for the 135 Professional Title and Tycen will be looking to get back on the winning track after his lost to UFC standout Louis Smolka. Miranda Granger Improves Pro Record to 5-0 in Atlantic City! Miranda will face 2 x Dana White contender series vet and former King of the Cage World Champion Jamie Colleen on Dec 14th. We have 5 fighters set to compete December 22nd at the AX Fighting Championships. 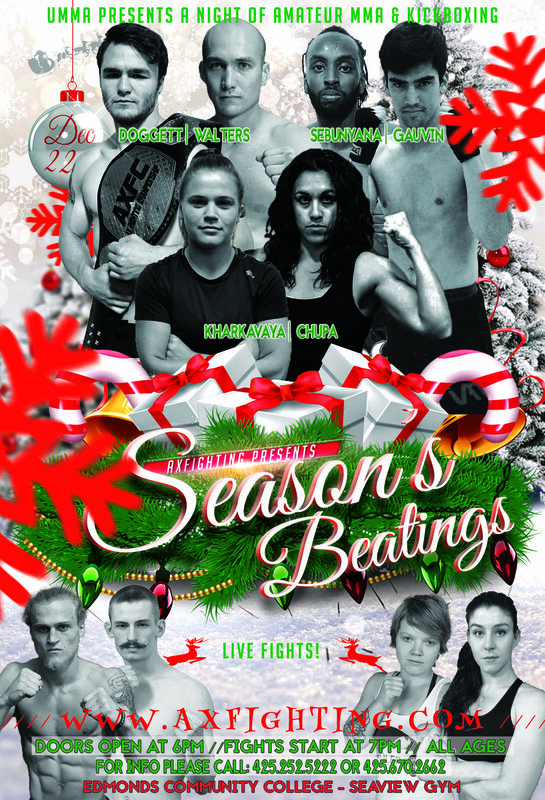 The event is called “Season’s Beatings” and will be at The Edmonds Community College Seaview gymnasium. The doors open at 6pm and the fights will start around 7pm. Tickets can be purchased at the gym or online HERE. Ryan and Bruce both look to keep their undefeated MMA records in tact. Katie, Yasmin and Carson all will be competing in kickboxing matches. C3 professional fighter Miranda Granger is set to fight at the Cage Fury Fighting Championships (CFFC) in Atlantic City on December 14th. Her opponent is former King of the Cage World Champion Jamie Colleen. Congrats to C3 fighters Joey Elzea and Miranda Granger on their wins at Dominate FC 2. Joey retained his Batamweight title and Miranda picked up her first pro title in the Strawweight division. Congratulations! C3 professional fighter Miranda Granger was featured in the Everett Herald. Click the picture of Miranda to read the article.